Want to secure your home in Perth from the burglars or intruders out there in your town? 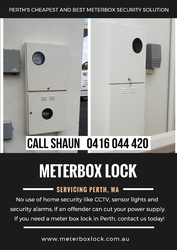 Meterbox Lock offer electric or gas meter box security lock system that are simply unbreakable by the intruders. Our meter box locks are specifically designed to meet the Australian Standards and increase your personal safety at home. We offer single or double meter box installation at best prices in Perth. The best home security is useless if an offender can turn off your power, install Meterbox lock now. Get in touch with us today to discuss your requirements; Call us — 041 604 4420.